Every school year, elementary school students are faced with new challenges. They have to make new friends, get to know new teachers and learn how to juggle more complex courses. But there’s at least one stressful thing second-graders at Godley Elementary School in Texas won’t have to worry about this year: homework. 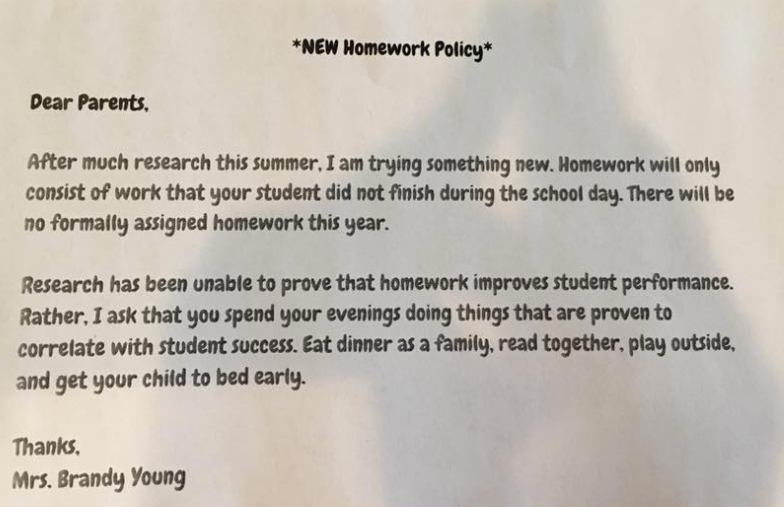 Brandy Young, a second-grade teacher at the school, passed out a letter to every parent at a “Meet the Teacher Night” ahead of the start of the school year to explain her new homework policy -- or should we say, no-homework policy. The teacher said homework just wasn’t working for her classroom anymore. So, she decided to make meaningful change. Dozens of people praised Young’s view on homework, Gallagher included. “Finally more teachers are catching on to this!” one Facebook user commented. “Hopefully this will change some things,” another wrote. Gallagher is looking forward to the new routine. “We’re happy that at the end of a long school day she’ll get to come home and unwind and be a kid... go outside to play, make new friends, spend more time as a family,” Gallagher said. Young, who is a parent herself, wants to bring more families together. The Godley Independent School District is a district of innovation, following The Leader in Me school model, Young explained. Several other teachers within the district are also considering taking a similar “no homework” approach. And Young is happy to hear it. “For any teacher considering anything that might benefit their students I say go for it; if something doesn’t work, change it,” she said.